This video is absolutely heart wrenching, and it first made me cry, then made me plain angry. After several minutes, I sped up the video to see if it ever ended. It did. With the actor turning his face in tears and frustration at what had just occurred. In that moment, it became very personal. In that moment, you can see the agony of his experience in his ratty clothes vs. his suit & tie. Jesus says what we do for the least of these, we do for HIM. How could no one have stopped for this man? Just because of his ratty clothes? Life shouldn’t be based on appearances, but sadly, a lot of our judgement, or opinions, are formed by observing, summing up and watching those around us. Because of this, Dale and I pray very specifically, that when people see our family, they see JESUS. 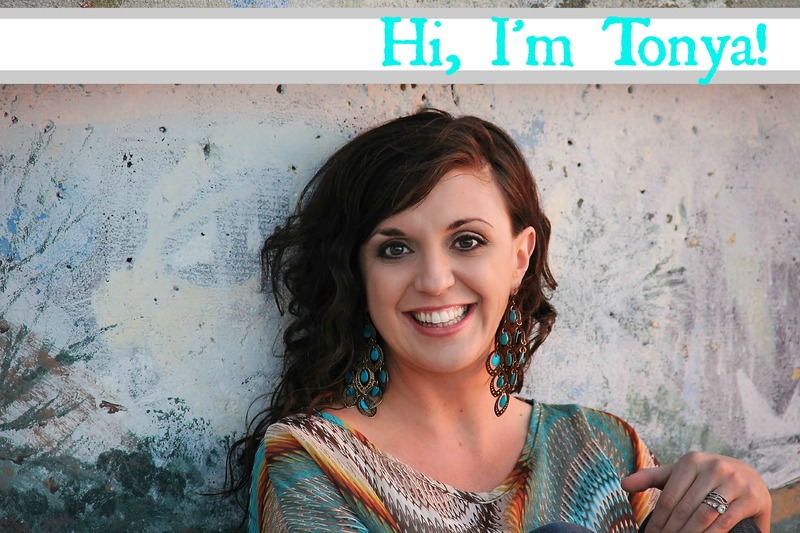 On the blog, at the store, wherever we are, we want to be a testament for Christ. Not because we want to be perfect or on display, but because we represent Christ in all we say and do to a watching World. Half a dozen times in the past month, a waitress, store worker, a lady at the beach, that came over to specifically say they enjoyed watching our family interact in such a fun and loving way. Or to mention what good manners the kids have, how nicely they play together, or how neat we left the floor and table after we ate at a restaurant. 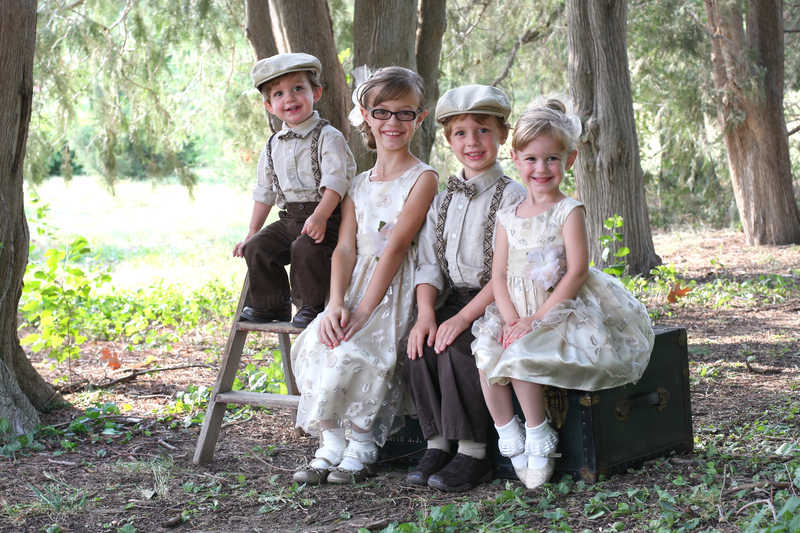 I don’t want this to sound like we are being boastful, because when it happened, Dale and I looked at each other over the kids heads, and knew, God was clearly answering our above mentioned prayers and encouraging us in this way. Last month, when the kids and I helped someone at our Grocery store with such little things, we were met with such strong reactions, I left internally pondering what had just occurred. We offered a gal in a wheelchair cart, assistance unloading her items on to the belt, and at another store, a young woman left her wallet in her cart, so we took it to her. It was a no brainer to be quite honest. Both times the people and workers around us stopped and stared with jaw slack, “That was so NICE of you to do that!” Oh my goodness, on and on they went. Is kindness so very rare these days, that it is met with gushing compliments, and jaw-slacked shock? Jesus tells us we are to be His hands and feet. To be set apart. He reminds us that whatever we do for the least of these, we do for HIM. That is how I want to raise my kids, to be the ones to stop and help. To look around with open eyes and see the needs of others. We go to the Grocery store every week, and see the same people. We smile and say good morning, we greet them by name if we remember them, or can see their tag. Without prompting the other day, Paxton and Avery turned to the Grocery Bagger, who had walked the 3 of us to the car to unload our groceries, and told him, “Thank you, sir!” before hoping in their car seats. He about fell over. He said, in all my years working here, I have never had children thank me for assisting their mother with her groceries. In Proverbs 20:11, it says that even our Children are known by their actions, whether they are good or right. We talk about this verse to our 4 little Fergusons a lot at home. We tell them that when people see our family, we want them to see Jesus reflected in everything we say and do. And we also let the children hear us pray every night, during family devotion time. More importantly yet, we as parents, we must not only SAY these things to our children, but let them SEE its truth it our actions, too. Our little 5 year old Peanut has it right, she knew it wasn’t a pat on HER back, rather a nod to her Father in Heaven. Your actions will make a far bigger impression on your children, than your words ever could. Remind them to be Jesus to the World, but then SHOW them how in your daily interaction with the world…..
Dale’s devotional this morning said that 80% of everything a child learns in the first 12 years of his life, is from watching, not listening, to the words spoken in our homes. WOW. Think about that for a second. How much time do I waste giving lip service to this quest, when I should just focus on continually showing my kids Christ in my actions towards others. ~Buying someones lunch just because…. We never know who is watching our family’s interactaction, help them see you are different so they can wonder why. May they see Jesus in all we say and do. It doesn’t take much to brighten someone’s day, and you just might be surprised how it brightens your day as well….. 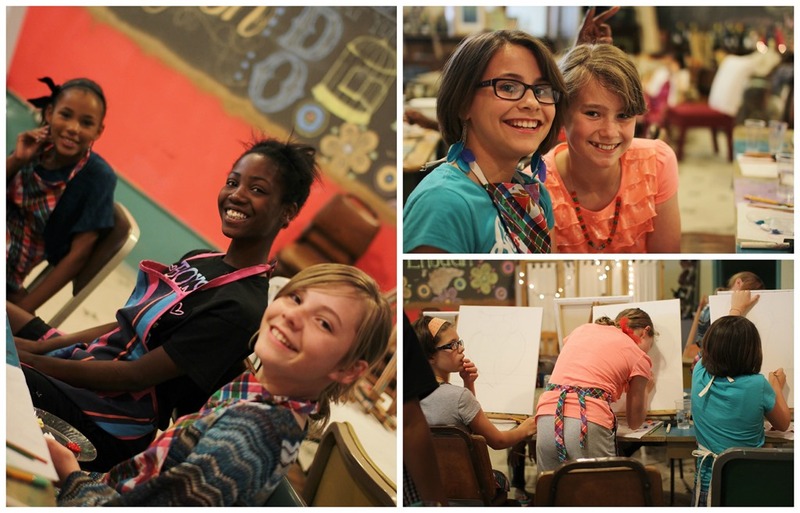 This weekend, the girls in Destiny’s 5th grade class got to have a Painting Party! We have the most DARLING Studio downtown now. 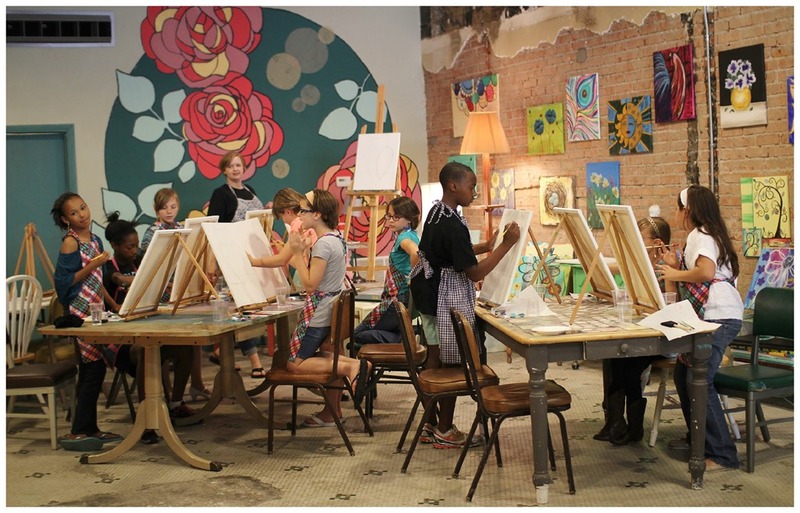 You can have a birthday party there, a wine & paint party for Mom’s, or just come and rub shoulders with other artists and work on a project or two. This particular gathering was for a rather sad purpose, one of the 9 girls in their grade is moving away. 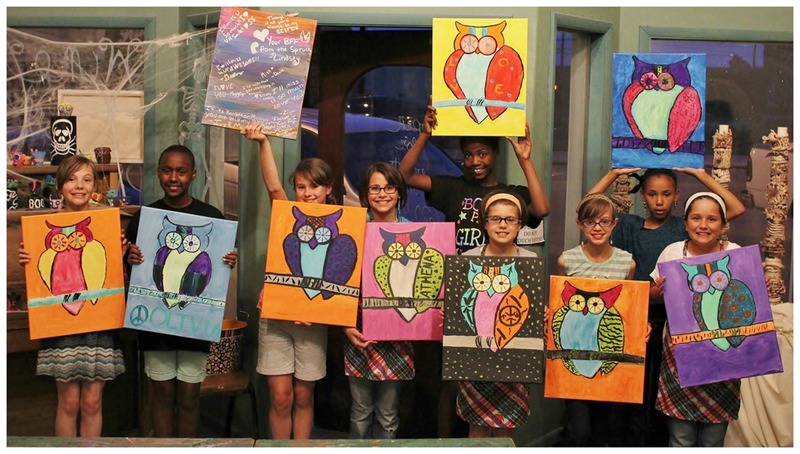 We wanted Cassie to have a special last memory with her friends, so this was the perfect scenario, especially since she was going to leave with not only her owl painting, but a painted canvas full of notes from her friends. Cassie is the one in the coral shirt. 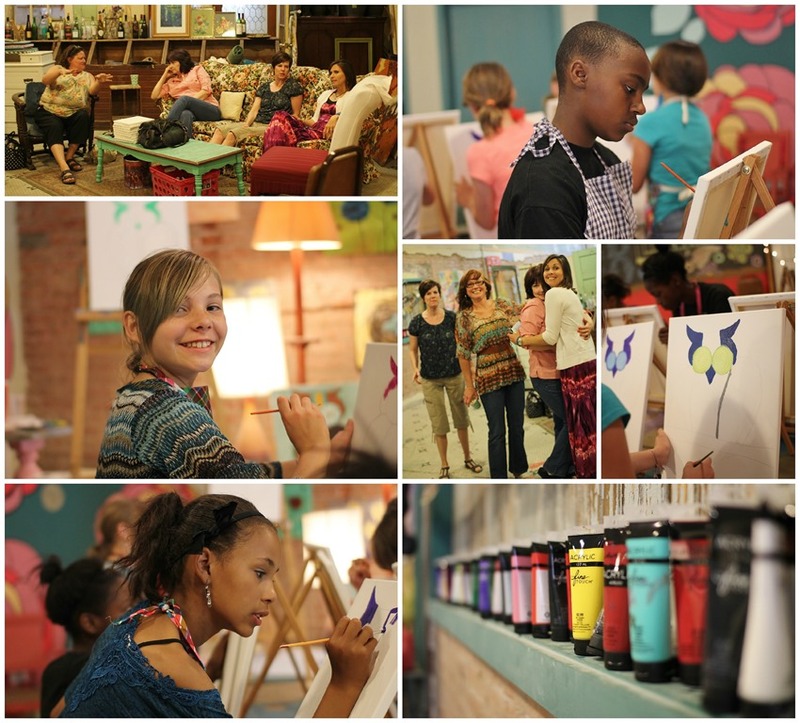 From the get go everyone was giggling and having fun….even the Moms over on the couch area. 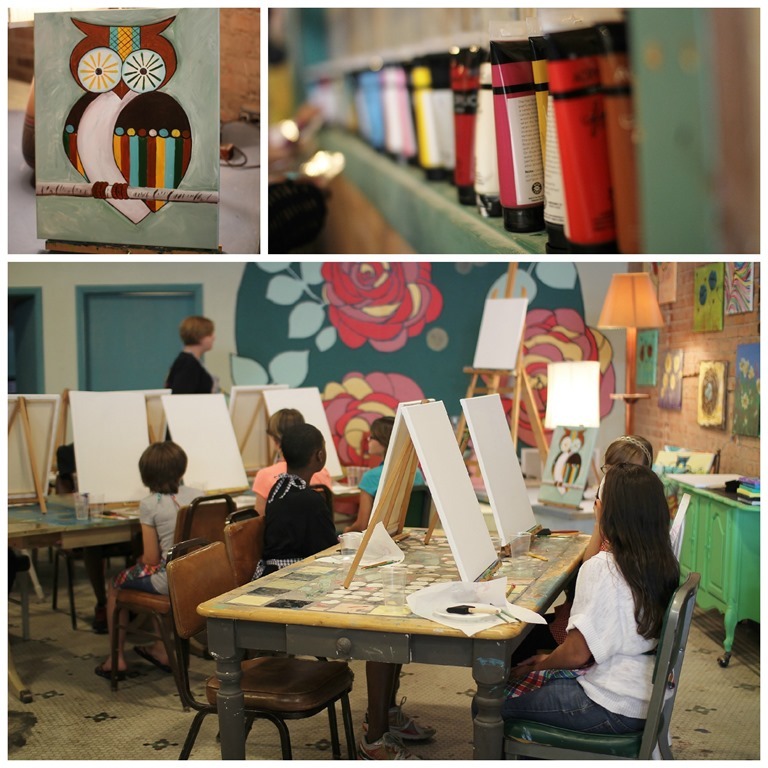 To start, the girls were to choose 5 colors, plus white for their owl picture. It was cool to see all the different color combos come out, per each girls personality. 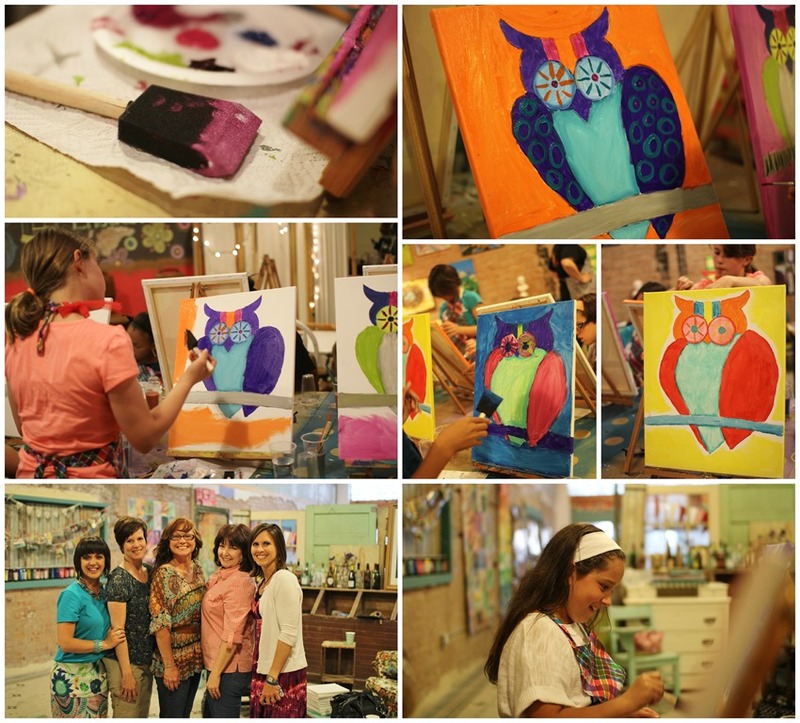 Miss Lacey, the instructor, talked them through the Owl Painting, step-by-step. 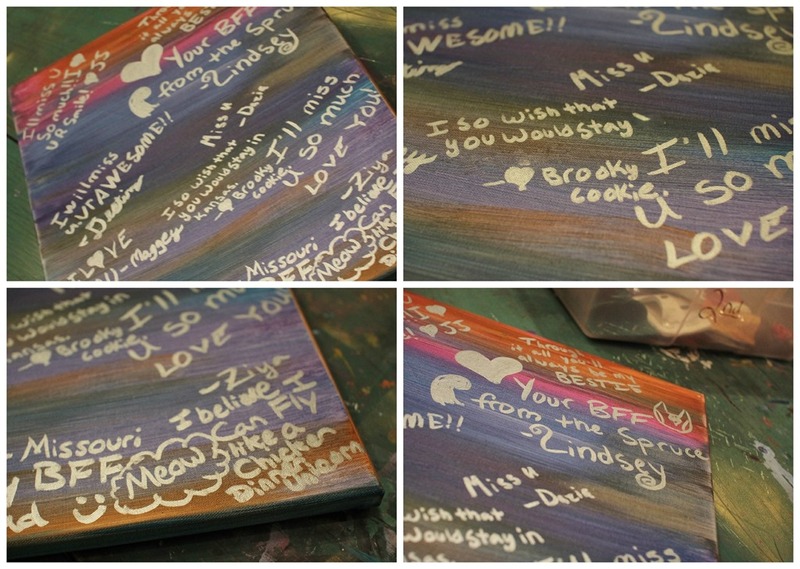 She said the girls did WONDERFULLY, as this is an extra hard painting for their age group. 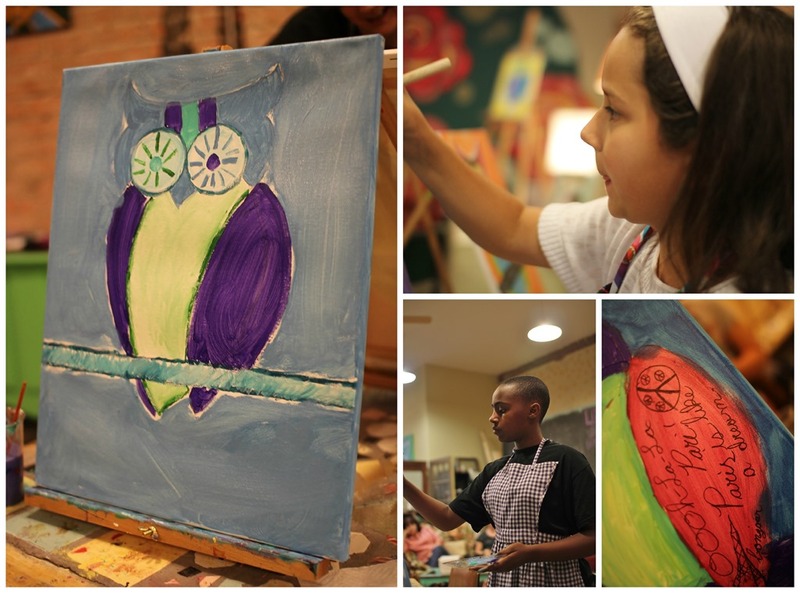 They spent 2 hours on these paintings before we got to the final touches. Ivy is showing below, that clearly standing on your chair gives you that oomph you need to finish up. 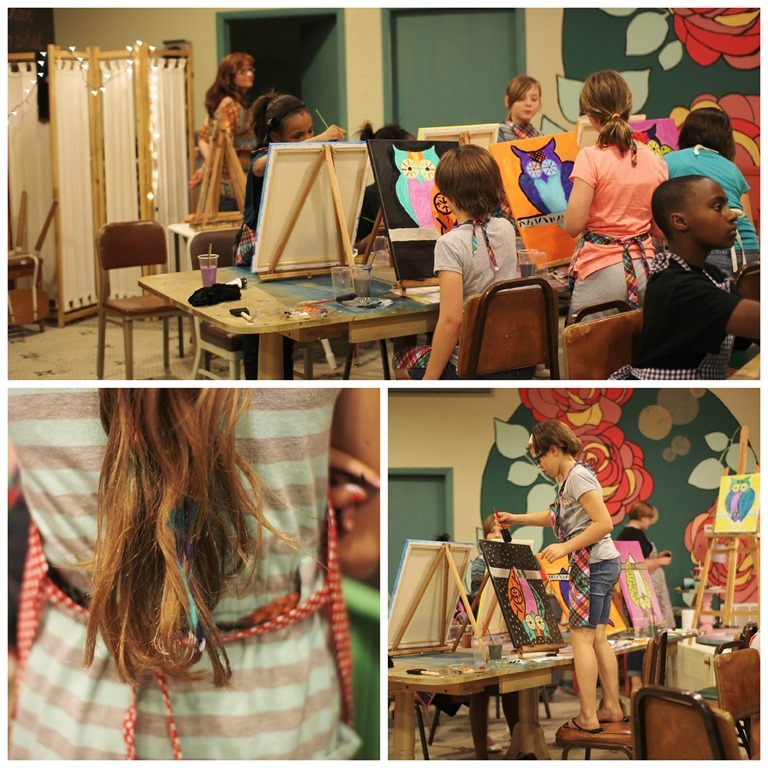 And apparently Destiny decided whipping her hair through her paint plate would be an add artistic flare to her hair do? It’s still not out after 2 washings, thankyouverymuch. At least its kinda pretty?! Such a perfect gift for Cassie to hang in her new room in her new home! The final product and tired, but happy girls! 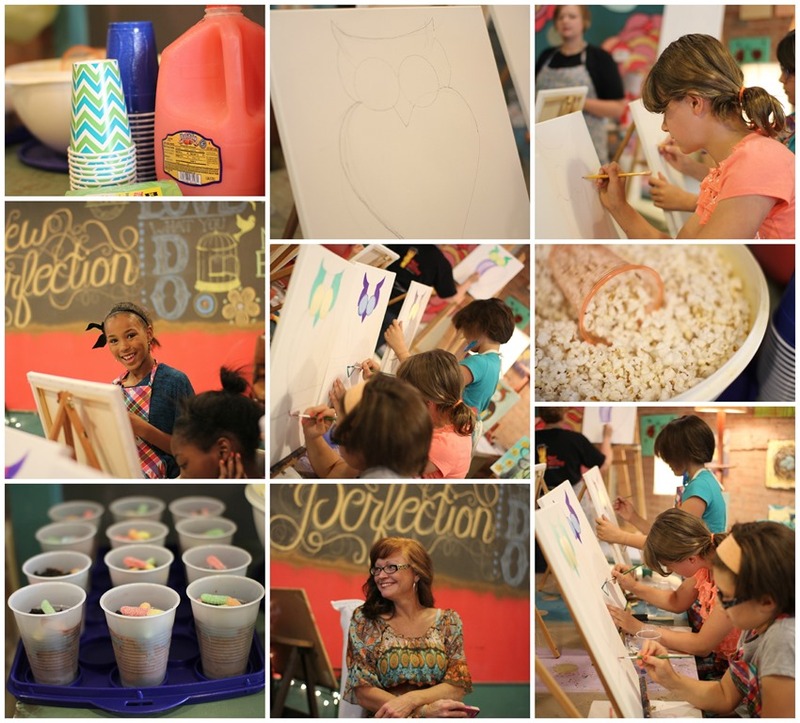 If you are looking for a unique place for a Mom’s Night Out, Sunday School Class party for a couples His & Hers paintings, or a special kiddos Birthday Party, this Studio is the place for you! If you are local, and would like more information from me, feel free to drop me a note on facebook and I can give you some specifics.